This has not missed, the processor A5X the new iPad was soon to be "dissected". The first observations of UBM TechInsights and Chipworks, who had already combed the A4 and A5, confirm that the A5X is a chip transition. The improvements are real, but not spectacular. 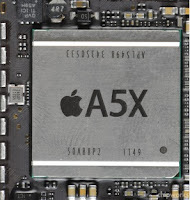 Like its predecessors, the A5X is always produced by Samsung and is 45 nm. In this regard, we recently learned that TSMC, which is supposed to produce the successors of the A5 processor knows the problems with its transition to a fine engraving of 28 nm. This problem occurred late last year may explain the conservative choice of Apple (read: Towards MacBook Pro 15 "without dedicated Nvidia graphics card? ).